We are a leading Manufacturer of journal jacks, electro mechanical lifting jacks and mechanical track jacks from Belgaum, India. 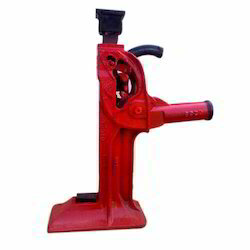 One can avail from us a quality range of Journal Jacks. These jacks are light in weight and their low height makes them ideal for use even in most congested locations. These heavy duty maintenance free jacks are ideal for use in erection of machinery, industrial plants, bridge construction, ship building work and railway carriage. These products are acknowledged for their corrosion resistance and durability. Offered jacks are obtainable in committed time frame. 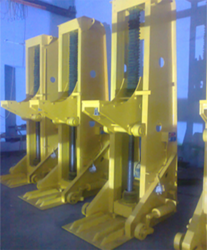 We are engrossed in providing excellent quality Electro Mechanical Lifting Jacks to our clients. These lifting jacks are used in sets for the lifting of railway rolling stock such as engines & bogies for repairing in railway workshops. They are also used for general repair work of big automotive jobs and wherever synchronous lifting is required. Offered lifting jacks require less amount of maintenance and gives excellent performance for long time period. Matching with the requirements of the clients, we are presenting a quality range of Mechanical Track Jacks. These are the simplest and sturdiest type of jacks for rough use. They are ideally suited for Railway track work, lifting and leveling of heavy machinery etc, for almost ground level in ship yards, industrial establishments, mills & mines. These Jacks are also provided with foot lifting arrangement. Offered products are easy to install and known for rendering hassle free performance. 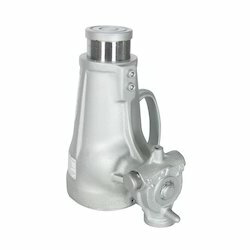 Looking for Mechanical Lifting Jacks ?